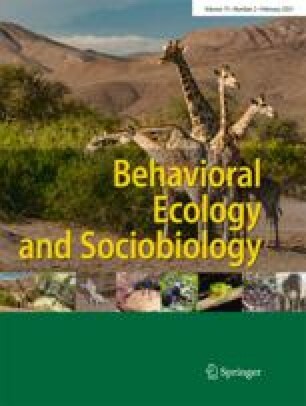 Free-ranging adult male baboons give loud two-syllable ‘wahoo’ calls during dawn choruses, interactions between groups, when chasing females, and in aggressive interactions with other males. Previous research has shown that the rate and duration of these contest wahoos are correlated with a male’s competitive ability: high-ranking males call more often, call at faster rates, and call for longer bouts than do low-ranking males. Here we report that acoustic features of wahoos also reveal information about male competitive ability. High-ranking males give wahoos with higher fundamental frequencies (F0) and longer ‘hoo’ syllables. Within-subject analyses revealed that, as males fall in rank, the hoo syllables tend to shorten within a period of months. As males age and continue to fall in rank, F0 declines, hoo syllables shorten, and formant dispersion decreases. Independent of age and rank, within bouts of calling F0 declines and hoo syllables become shorter. Because wahoos are often given while males are running or leaping through trees, variation in these acoustic features may function as an indicator of a male’s stamina. The acoustic features of contest wahoos thus potentially allow listeners to assess a male’s competitive ability. We thank the Office of the President and the Department of Wildlife and National Parks of the Republic of Botswana for permission to conduct research in the Moremi Wildlife Reserve. Jim Nicholson, Kurt Hammerschmidt, Mokupi Mokupi, and Keena Seyfarth assisted with data collection. Ryne Palombit kindly made some of his recordings available for analysis. We are grateful to Dana Pfefferle for support with the acoustic analysis, and Daniel Stahl for statistical advice. Three anonymous reviewers provided valuable comments on the manuscript. This research was supported by the Deutsche Forschungsgemeinschaft (Fi 707/2; 707/4), and by National Science Foundation grant IBN 9514001, National Institutes of Health grants MH62249, the Leakey Foundation, and the Research Foundation of the University of Pennsylvania. This research complies with the laws of the Republic of Botswana and was reviewed and approved by the Institutional Animal Care and Use Committee (IACUC) at the University of Pennsylvania.